Drawing knowledge from her diverse background and 15 years experience in systems engineering, computer consulting, customer support, courseware development, training, marketing, project implementation and department management, Isa Isaacs founded the Temple of Poi, a school and community dedicated to empowering artists to gain greater facility with their body movement and increased body awareness through the use of poi. While her career in the computer industry garnered her financial success and various awards for performance excellence, Isa sought to integrate her artistic passion and creative desires with her entrepreneur spirit. In addition to supporting her corporate career, Isa spent over 20 years dabbling with various music projects including singing, flute, electronic music composition and has even published her own piano CD of original songs. In 1998, she gradually moved from making and providing the music to dancing and performing to the music. After two years of dancing, she found poi in early 2000. 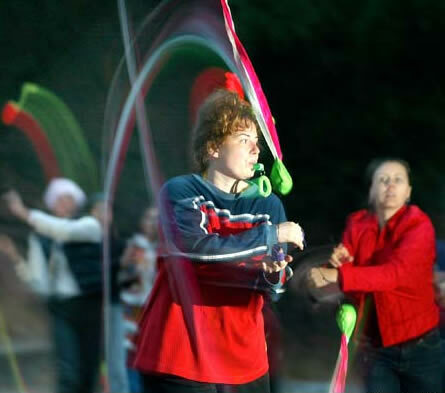 Over the next two years, she developed her artistic skills with poi and in January of 2002, she became a professional poi fire and light dancer after leaving her corporate job in February of 2001. In an effort to develop her own self expression and artistry through poi, she established the school in the Summer of 2002. She believed that teaching the art form would enable her to gain greater mastery herself. Early on, the school worked only with beginners, but as the demand for education rose, the Temple of Poi shifted and the school now focuses on poi education for all levels of artists from the novice who has never used the tool to the most advanced performers looking for coaching on how to improve their performance presence and poi technique. Isa, also known by her performance name "GlitterGirl", is continually developing new classes, workshops, gatherings and other opportunities to support the growth of her students and raise the awareness and standards for poi artists everywhere. She is currently performing both as a solo artist and with the Temple of Poi light and fire dancing troupes (fireFLYgirlz/Illegally Hot) and on occassion, dances with Erin's group, Fire Pixie Fire Performance. When she is not playing, teaching or performing poi, she can be found DJing at clubs and parties in the Bay Area or working on art installations. Her most recent art installation, "Light in Flight" is a 13 by 10 foot origami, crystal, glitter and wood mobile and was installed in November of 2003 in Studio Z (11th and Folsom) in San Francisco. Since the Temple of Poi was established in the early summer of 2002 in San Francisco, California, it has rapidly grown and provided education to nearly 300 students and artists from around the world. In response to the growing demands of poi artists, additional classes are offered in other areas around the country and the school has recently expanded to offer ongoing education at a second location in Freemont, California. Isa and the Temple of Poi were featured on the front page of the Living Section of the San Francisco Chronicle in August of 2003 (http://www.sfgate.com/cgi-bin/article.cgi?f=/chronicle/archive/2003/08/17/LV179406.DTL&type=news).